01) Enroll for the mobile/email alerts tool of your Bank. 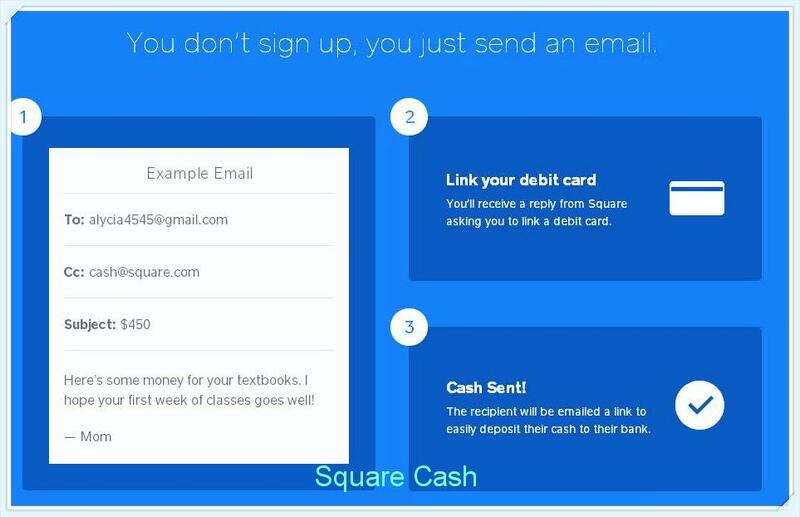 03) To send money, users send an e-mail to the recipient’s address, CC’ing pay@square.com and putting the dollar amount in the subject line. 04) Only US Dollar transactions are accepted. 05) Funds are directly deposited into the recipient’s bank account, rather than held in a stored balance account. 06) The processing time is 1 to 2 business days. 07) The recipient too has to add his/her Debit Card Number, Expiry Date and Zip Code. Recipients’ have up to 14 days to accept the money. 08) At present, there is no method to cancel the ‘transfer’, unless the Sender’s bank account does not have funds. 09) Square has in built anti-spoofing methods, which is not yet made public. 11) In case they wish to transact a higher amount, i.e upto $2,500, they can opt for the “Gold Status” by providing a mobile phone number and linking to a Facebook account. 12) To safeguard your money, have a continuous track on your debit card linked bank account. Report any suspicious transaction immediately to your bank customer care. 13) Once the mail is sent, take a copy of it, and store it in your PC. This is necessary for tracking payments at a later date, and you are unable to access your email account. As the number of eTransactions keeps increasing in our daily financial world, the number of criminals trying to access the customers’ finances is also on the increase. Yes, there have numerous tools released by Payment Giants to reduce the instances of fraudulent transactions. It is like a cat and mouse race, and when the tips favor the criminals, the shoppers might reduce their eTransactions. The challenge for Payment Giants is the varied messaging systems, which at times do not talk to each other. Yes, diversity is good, as in case a messaging system is compromised, the risks will be restricted to that messaging system only. The other part of the coin is oligopoly, which is preferred over Monopoly. To raise the security barrier for eTransactions, the three major Card issuers i.e Visa, MasterCard and American Express have joined hands. They have proposed Digital Tokens for online and mobile transactions. The broad guidelines have been finalized, and they are calling on other industry players to support their proposed framework for the new standard, which would be a Global Standard. The main supporting argument is that the Digital Tokens would make life simpler and safer for customers shopping on a mobile phone, tablet or PC. The proposed framework would see issuers, merchants and digital wallet providers able to request a token so that when an account holder initiates an online or mobile transaction, the token – and not the traditional card account number – would be used to process, authorize, clear and settle the payment. The tokens can be customized basing on customer risk preferences i.e tokens could be restricted in how they are used with a specific merchant, device, transaction or category of transactions. The new framework will be built around existing industry standards to keep the investment to a minimum and also ensure consistency around the world. Over the coming weeks, the framework will also be presented to other partners and independent industry bodies, such as The Clearing House, PCI Security Standards Council and EMVCo, to align and further advance the standard. MasterCard and Visa in a joint application to the Australian Competition and Consumer Commission have supported PIN only credit card transaction. Both the major card issuers feel that the Signature requirement on Credit Card Slips is the major cause for credit card fraud. Hence, they have opined that only PIN@POS be adopted to reduce the card fraud. PINs are difficult to be stolen, whereas signatures can easily be forged. Moreover, I am not sure as to how many merchants verify the signature on the card and on the slip. In India, the % is less .05%. As PIN@POS involves a major infrastructure upgrade, small merchants are very receptive to this idea. Moreover they feel that the transactions volumes might reduce. Mobile eftpos terminals have to be brought or customers have to walk to the cash counter. This should not be a major deterrent, as the mobile eftpos terminals are not that expensive. However, in India after introduction of an additional factor of authentication for CNP (Card-not-Present) transactions, the value and volume have gone up. Business associations had the same fear, that RBI’s move on CNP transactions would affect eCommerce. But, the Indian consumers are savvier. Other card issuers like American Express, Diners also support Visa and MasterCard on this. However, American Express is not a signatory to the proposal, as signing the proposal might be viewed as cartelization!! As it is already Visas’ PayWave, MasterCards’ PayPass, digital wallets, mobile apps, online payments do not use Signature as an authentication tool. IBPS has partially modification to the Original Notification dt. 10/07/2013. The wide-ranging changes should enable more Indian citizens to try their luck, to be part of India’s public sector banks (PSB) HR network. As of now, these changes are only for the October 2013 written exam, for appointment as Probationary Officers and Management Trainees. Under the changed rules, the maximum qualifying age has been changed from 28 years to 30 years, allowing a larger number of candidates to appear for the exam. Further, according to an official release issued on Monday, the mandatory requirement of being computer literate, that is, having a degree, diploma or certificate in computers or having computers or information technology as one of the subjects in high school, has been done away with. As the number of candidates is set to increase, the dates for registration and paying application fees have also been extended. The candidates can now register online and pay the fees online by August 17 instead of August 12 earlier, while the deadline for payment of fees (offline) has been extended to August 22 (from August 17, earlier). The online payment can be made by using only Master/ Visa Debit or Credit cards or Internet Banking by providing information as asked on the screen. Rupay Cards and IMPS (Immediate Payment Services) is not yet activated. Payment from eWallets too are not accepted.